Constructed of black powder coated steel, our strong yet lightweight Garden Posts offer the same quality workmanship that you expect from Benner's Gardens at a lower cost than our Heavy Duty Posts Kits. 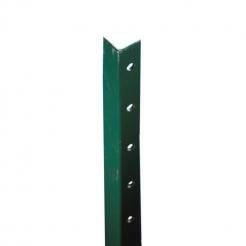 These posts are ideal for small garden areas or enclosures that are less than ¼ of an acre with medium to low deer pressure. To install, simply drive post into the ground using a sledgehammer. For best results, set Garden Posts about 10'-12' apart. No driving cap or sleeves required!